To enhance the personal safety of the campus community, the ICC Police Department is now offering “ICC Guardian,” a free mobile safety app for smartphones. The Guardian app is a direct connection to the Campus Police Department emergency phone line. It eliminates the need to find the emergency number when seconds count. Guardian also gives you the ability to text with Campus Police. Crime tips or other information can be submitted (anonymously, if you wish) and photos can be attached to the text. A Campus Police dispatcher will respond to all incoming text messages. Additionally, Guardian contains an ICC phone directory and website links. 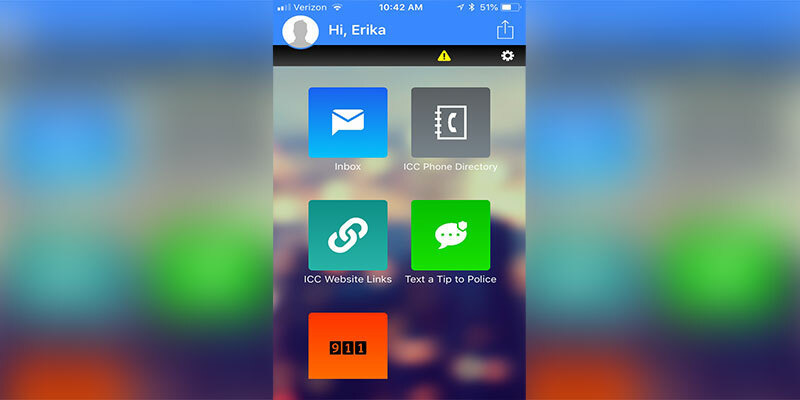 With the directory, you can look up and contact various ICC departments directly from the app. The website-links feature opens a browser and takes you directly to specific ICC webpages of your choosing. To download the Guardian app, search for “Rave Guardian” in the app store on your mobile device. Registering on the app is quick and easy and requires only your cell phone number and your ICC email address – For example: [email protected] (employees) or [email protected] (students). To verify your cell phone number is registered with ICC, log into your MyAlert account at icc.edu/MyAlert and scroll down to “Mobile Contacts.” Click the “Test” button to receive a confirmation text. At this time, we encourage all students and employees to download the ICC Guardian app and become familiar with it in anticipation of the fall semester. The Campus Police Department would appreciate your feedback once you have a chance to explore the Guardian app. Send your comments and suggestions to [email protected].